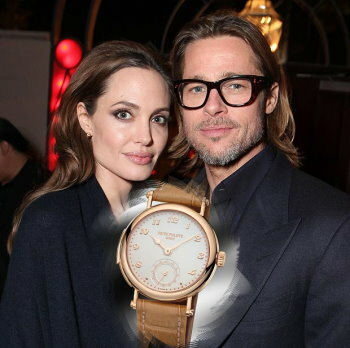 BRAD Pitt has spent £250,000 on one of the world’s most expensive watches as a wedding present for fiancée Angelina Jolie. The Fight Club star snapped up a luxurious Patek Philippe Minute Repeater — even though there’s normally a two-year waiting list. The custom-made timepiece is gold with a mother of pearl dial and takes two months to make.Each one is checked by a member of the Stern family — who own Patek Philippe — at the firm’s HQ in Geneva, Switzerland.A source said: “Brad decided to buy one of the amazing watches after meeting the Stern family at a watch fair in Basel. “He wanted to buy Ange a unique gift that very few people own which is like a piece of art — and the highly sophisticated watch is just that. “It chimes sounds based on Big Ben and is constructed by hand. “He went to Geneva to pick it up and it’s believed he’ll present it to Ange as a pre-wedding gift.”Brad, 48, got engaged in to Angelina, 37, in April.They are to marry in a ceremony at their French chateau. The couple are currently living in Surrey with their six children. Posted on August 8, 2012, in News and tagged luxurious Patek Philippe. Bookmark the permalink. 2 Comments.